NEW YORK—In his continuous efforts to build a viable relationship with the Chinese people and to clarify the Chinese regime's false propaganda on Tibetan issues, the Dalai Lama met with over 120 pro-democracy activists, scholars and dissidents at the Waldorf Astoria Hotel in New York on May 5. 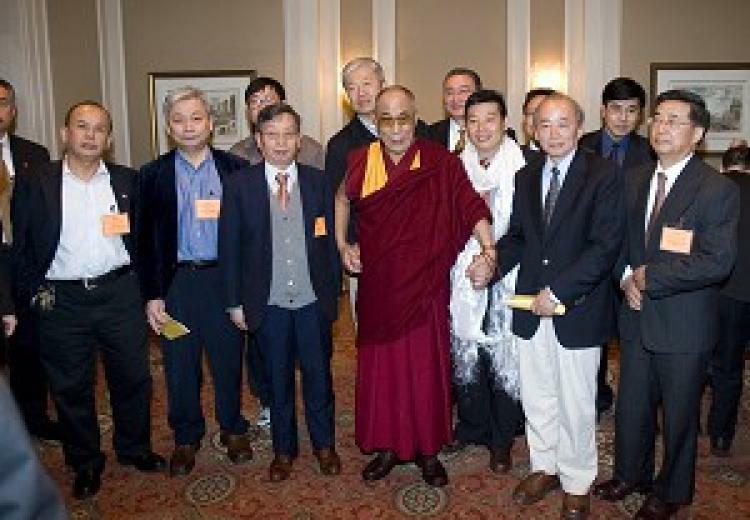 He appealed to overseas Chinese intellectuals and media to visit Tibet and spread the news about the real situation there. In his opening remarks, the Dalai Lama spoke about how he had been deceived by the Chinese Communist Party (CCP) years ago. In 1954, he went to Beijing to attend the first session of the National People's Congress as a vice chairman. He met with Mao Zedong, the then-leader of the communist party, and other officials, and was under the impression that they were all faithful representatives of the people and had a clear plan. He was attracted by Marxism and he even thought of joining the communist party. In 1954 and 1955, many Tibetans were very excited, thinking that they would have a better life under the leadership of the CCP. However, it didn't take long for them to realize that they were wrong. The regime's reaction to the famine and armed resistance in east Tibet in 1956 proved to them that for Tibet, “autonomy” is just a word jotted down in the Chinese Constitution. The CCP’s real goal was to control Tibet. The Dalai Lama also spoke about the misunderstanding between the Chinese and Tibetans caused by the CCP’s false propaganda put forth as official information by China’s state-controlled media. Many in the overseas Chinese community, particularly Chinese students, were very angry after they heard the false information about the Tibetan uprising last March. With his world tour and open discussion with the Chinese, he could actually see the changes in their attitude. The Dalai Lama expressed his thanks to the Chinese overseas media for the large number of reports on the real situation in Tibet after the Chinese regime opened fire on Tibetans on March 14 of last year. He believes these reports played a great role in clarifying the facts to the Chinese people. When asked about the issue of democracy in China, the Dalai Lama said that it is very dangerous for such a large country to not enforce the rule of law. "In democratic Taiwan, even the former President, Chen Shui-bian, could be arrested and detained for a financial scandal, whereas this is totally impossible in China. That is why high-ranking officials can be so corrupt. Establishing a democratic system is the only solution to the problem of corruption in China," the Dalai Lama said. “The Communist Party has reigned long enough. Now it is time for their retirement,” he said.